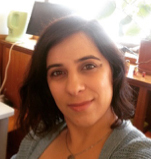 Cristiana Alves is a Research Fellow at INL. She was awarded the Marie Curie COFUND action (NanoTRAINforgrowth II) and is working in the Atomic Structure-Composition of Materials group at the Advanced Electron Microscopy, Imaging and Spectroscopy Department. Her research activity focuses on determining the phase and chemical composition distribution in micrometric NMC polycrystalline particles, to understand the Li mobility during charge/discharge and consequently the performance of these Li-ion battery materials. She holds a PhD degree in Materials Engineering from the University of Minho, Portugal. During her PhD, Cristiana had the opportunity to conduct research abroad and collaborate with the International Iberian Nanotechnology Laboratory (INL), the Center of Mechanical Engineering of the University of Coimbra, CENIMAT/I3N at the University of New Lisbon (UNL) and the Département de Physique et de Mécanique des Matériaux of the University of Poitiers.